Four of the studio artists exhibited during October. SPRING FLING was a bright exhibition of paintings and sculptures just right for warmer evenings and pleasant days, which opened at the Boans Warehouse Gallery of Modern Art in Saunders Street, East Perth, on Thursday 19 October 2006. Artists Frances Dennis, Graham Hay, Sarah Jane Marchant and Carol Rowling are members of the Robertson Park Artists Studio, well known for wild studio parties every couple of years. Local East Perth resident Carol Rowling cuts into the canvas of her multi-layered paintings with an angle grinder to create refreshingly unpretentious art. Her work features throughout the Bunker Bay Resort at Dunsborough, and she recently featured at Code Red in Claremont. Carol is shortly flying off the Sydney, but will return to WA in 2007. 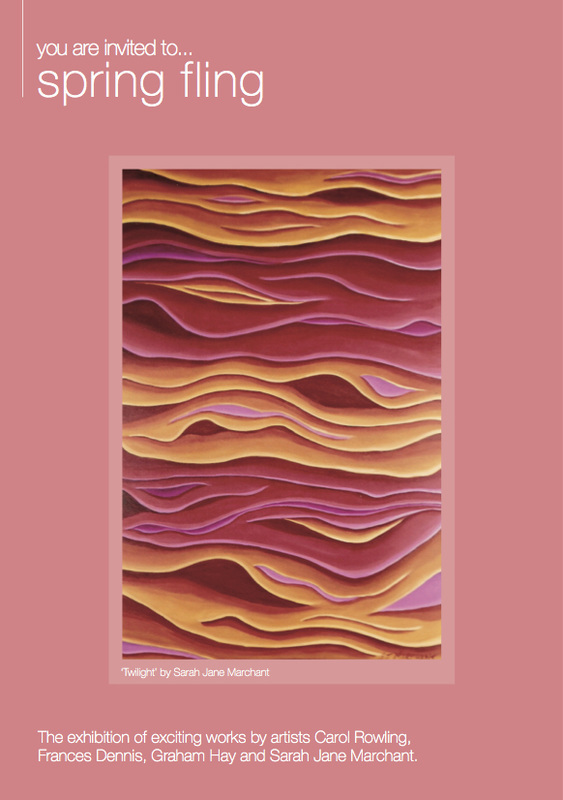 Last year painter Frances Dennis travelled through France and her exhibition work is inspired by medieval texts and textures on stone, created from the rubble of old buildings torn down by previous regimes. This year Frances has kept local travel agents busy with a trip through South Africa, Zimbabwe and Zambia, chasing wildlife and tagging a rhino from a helicopter, flying off to Hong Kong to visit family and, on the weekends, riding with the Ulysses Motorcycle club. Graphic designer Sarah Jane Marchant trained in London and spent a year sunbaking in Broome before knuckling down in the studio for a solid two months. She has sold new paintings, which feature the Bungle Bungles and Boab Trees, at the Towns of Vincent and Victoria Park exhibitions. Perth sculptor Graham Hay had just returned from a month avoiding terrorists and creating art in Pakistan. A sucker for work he also gave workshops in Singapore and Queensland, exhibited in Japan and finishing a commission of 100 sculptures for the Peppers Resort at Salt on the Northern NSW Coast. He has conquered his paperwork by mixing it into his clay scultures and firing it, or by bolting the pages closed and carving it. 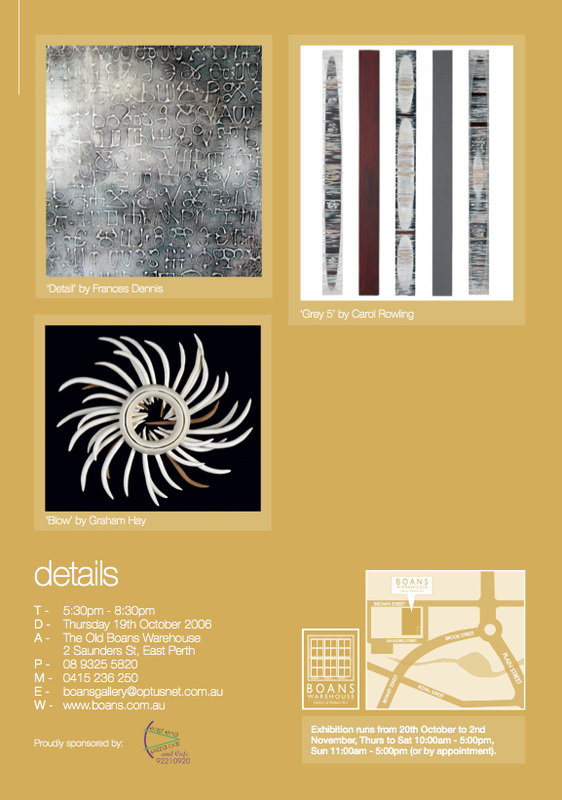 The exhibition ran 20 October to 2 November, at BOANS WAREHOUSE GALLERY OF MODERN ART , 2 Saunders Street, East Perth.